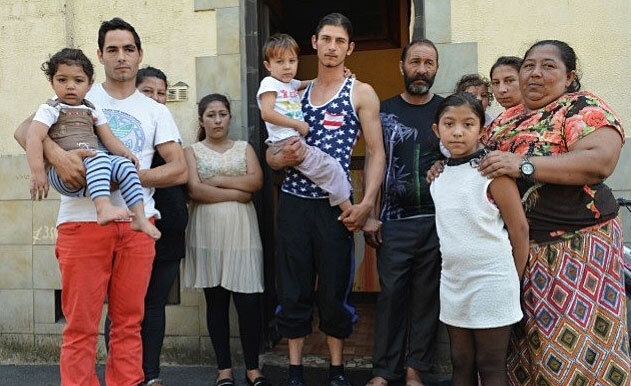 Crenguta is a young Roma lady living in France with 12 members of her family. They left Romania to escape extreme poverty and exclusion. Living in France for several years, they had been driven from their makeshift shelters more than once. For the last 15 months, Crenguta and her family have been living in a house that is to be demolished as part of an urban renewal project. The lawyer defending the family called on the members of the support group that helps her to rapidly obtain certificates to prove that families have good relations with their neighbours. The neighbours must agree to provide official certificates that will be submitted to the courts. Crenguta is ready to ask her neighbours but relies on the members of the collective to help her as she does not speak French very well. Feeling a little intimidated, because we were not sure how to present our request, we knocked on the first door. No answer! The neighbour has been out shopping but then sees us at her door. “They don’t bother me at all. They are quiet and kind. I have nothing against them”, the neighbour responds. She invites us in and sits us at the kitchen table while she dictates her message: “I have known the family for over a year. They are my neighbours and they are kind, I get on well with them. They don’t bother me at all”, she confirms. Her face, which expressed wariness at first, is transformed little by little. She is happy to help defend the family. The neighbourhood gets organised and other neighbours are contacted. In under an hour we obtain certificates, identity cards, and signatures of three other people. They are all quite welcoming. When we leave, we are very happy to have helped defend this family that the authorities say should not be here and who say that the local population is complaining about them. On the contrary, we see just how much these neighbours are touched that we asked for their help. Finally, it was agreed that the family would remain in the house until new housing could be found. The local authorities are helping to find new housing for them. Thank you, Crenguta, for making these happy meetings possible, due to the kindness of your family. Thank you to the neighbours for your help and for the warm example of humanity you have shown. It is moments like this that help us persevere in the difficult struggle to defend these families subjected to so much discrimination. More information on ATD Fourth World in France. More information on ATD’s work on housing issues.